Why Does My Pool Turn Green Every Week? 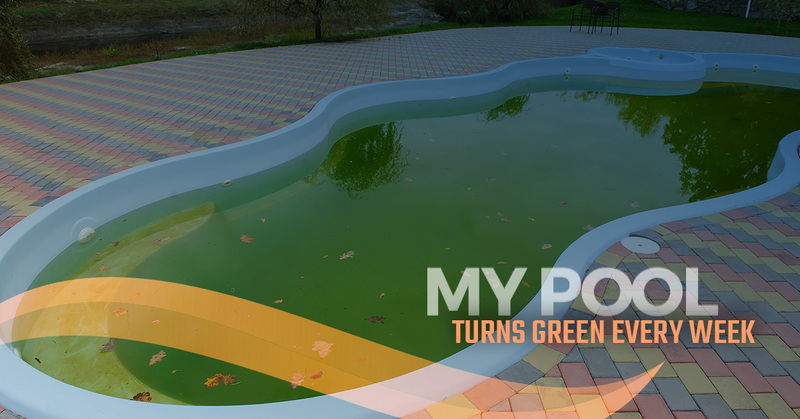 We receive calls daily from pool owners who are frustrated by their pool turning green every week, and the corresponding need to constantly shock their residential swimming pool. While there are several reasons and/or combinations of reasons why a pool turns green — poor water circulation, improperly balanced chemicals, contaminants, etc. — for the purpose of this article we are going to focus on improperly balanced chemicals, specifically chlorine stabilizer, also known as conditioner, cyanuric acid, or CYA, levels. Why Does My Pool Need Stabilizer? Chlorine stabilizer has an indirect relationship with your pool’s cleanliness and sanitation. 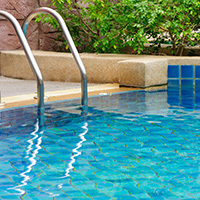 Free chlorine is needed to sanitize your pool, however, it is easily broken down and lost due to sunlight. Chlorine degradation in sunlight is surprisingly high. How fast does chlorine evaporate from a pool? Just two hours of sunlight on a beautiful day can reduce the chlorine level in your pool by as much as 90 percent. For this reason, chlorine stabilizer is needed and it acts as a sunscreen for the chlorine preventing, it from being burned up prematurely. How Does My Pool Get Stabilizer? If you’re using dichlor or trichlor sanitizer (stabilized chlorine) through tabs, sticks, or granular form, you probably won’t need to add any extra chlorine stabilizer to your pool water. Whenever you add either of those sanitizers, you get a little boost of stabilizer (CYA) along with them. That being said, unlike chlorine, CYA is never used up and accumulates in the pool water as a waste product. Once you have added it to the pool water, it will, for the most part, remain in the water. If you wish to avoid the problem of rising CYA levels, you can use unstabilized chlorine and add the CYA separately so you have a little more control over the levels. If you are using dichlor or trichlor, CYA levels should be tested at least once per week. How Much Stabilizer Does My Pool Need? The World Health Organization (WHO) recommends an upper limit of 100 parts per million (ppm) of CYA in a swimming pool. They arrived at this number based on the assumption that children will likely swallow some water while swimming, and if they ingest too much CYA, it can make them sick. That said, as CYA levels exceeding a threshold of 70 ppm can significantly reduce the effectiveness of a pool’s chlorine and the ideal CYA level for optimum pool sanitization has been determined to be 30‐50 ppm, to achieve the best balance between health and sanitization, prevailing recommendations are to maintain CYA levels around 50 ppm. Remember, more CYA doesn’t necessarily mean more protection for your free chlorine from UV rays. How Much Stabilizer Is Too Much? At CYA levels >70 ppm (almost always at levels >100 ppm) you will likely begin experiencing algae growth, some difficulty maintaining balanced chemistry, cloudy pool water, and decreased sanitizing. Once this begins happening, you will want to take a water sample into your local pool supply store for more accurate testing and to determine whether your CYA level is the cause of your pool turning green every week. How Do I Reduce Excessive Stabilizer Levels? For assistance with calculating your pool’s water volume, click here! If all this seems like too much for you to take on yourself, hire a local, trusted pool care company to handle all of your pool care needs! For help with cleaning your pool, correcting algae or CYA levels, or for routine maintenance, contact the experts at Florida Pool Care Pros today!